Herzlich Willkommen auf den Seiten des Teams Bembelbots! Unsere Seiten sind überwiegend englischsprachig, trotzdem haben wir auch einige Informationen auf Deutsch auf der Was-Ist-RoboCup-Seite für Sie zusammengestellt. Schauen Sie auch auf unserer RoboCup Video-Seite vorbei! Aktuelle Ankündigungen finden Sie auf den News-Seiten des JRL. Viel Spaß! RoboCup is an event where different schools and universities come together to compete in different fields of robotics. 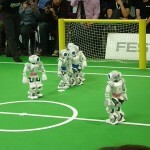 The main focus is to play robot soccer. Our team, the Bembelbots, has attended RoboCup German Open every year since 2010 in the SPL (“Standard Platform League”), we also attended the RoboCup Worldcup in Mexiko, Eindhoven and are successfully allowed to compete at the RoboCup 2017 in Japan! 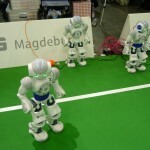 In this league each team plays football with three Standard Platform Robots on the field. In lack of hardware-diversity, the focus is to write better code than the others. Our team consists of about 15 people, mostly students of the bachelor and master degree and some PHD students. This collaboration is a perfect basis for education abroad the common university environment and enables students to strengthen their previously learned knowledge. Working in a team, beside these technical aspects, advances soft skills dramatically. The Joint Robotics Lab supports the RoboCup project, offering office and lab rooms to the students, and of course by providing the Nao robots. Lectures and lab courses like the Praktikum Robotik und visuelle Sensorik given by the JRL professors provide theoretical foundations and teach skills, the students need in the RoboCup context.